Terrified of spiders? There's an app for that! Everyone is afraid of something. 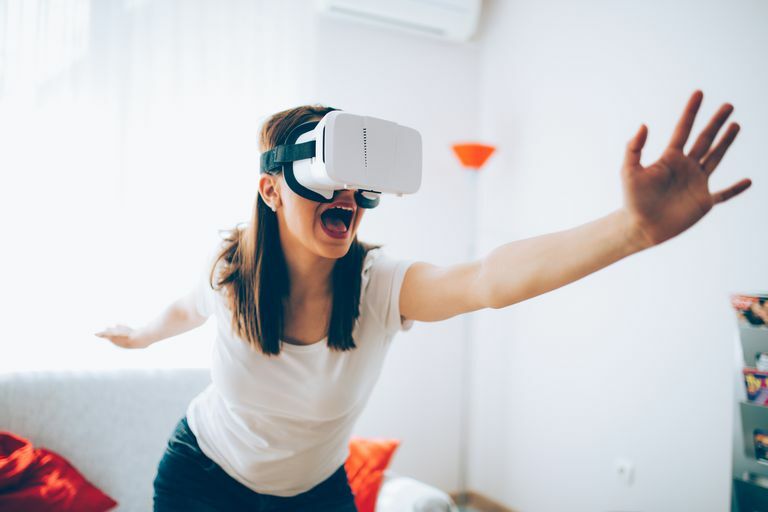 For those of us who want to face our fears ​head-on, the availability of consumer-grade virtual reality devices from Oculus, HTC, Samsung, and others has made fear exposure therapy possible. There are now a plethora of fear-facing apps that most anyone can download and use in conjunction with their VR headsets to try and see if they can conquer their fears. If you have severe fear and anxiety regarding something contained in the apps listed below, you shouldn't attempt to use these apps without the permission and supervision of your doctor. Exposure therapy is not something anyone should try on their own without proper supervision by a trained professional. Some of these apps are advertised explicitly as face-your-fears-type apps, while others make no claims of helping you deal with fear but were included in this list because they place users in situations that might be stressful and may relate to specific fears or phobias. The fear of heights is relatively common. It’s probably not a fear we encounter all the time in our everyday lives, but when we do have to deal with situations involving walking near ledges, riding in glass elevators, and so forth, our hearts can flutter, our knees can wobble, and we can experience fear and anxiety. Richie’s Plank Experience lets you walk a virtual plank on top of a skyscraper. In Richie’s Plank Experience, you start in the middle of a bustling city. The app places you at ground level right next to an open elevator that you enter. Once inside the hyper-realistic elevator, you make menu choices by pressing the elevator floor buttons. The first option, “The Plank,” takes you to the near top of a skyscraper. As the doors close and you begin to ascend, you hear soothing elevator music. You get a peek outside through the small crack between the closed elevator doors as you head toward the top. This glimpse helps heighten your fear as it also plays on the fear of malfunctioning elevators and shows you just how high the building is. The developer has done a great job with the photo-realism of the elevator and the environments. Its surfaces are very reflective, and the lighting is superb, as is the wood grain detail of the actual plank that you walk on. Another attribute that heightens your immersion in this app is the sound design. When you reach the top of the elevator and the cheesy elevator music stops, you hear wind noise, the sound of the distant city traffic below, birds, the noise of a passing helicopter, and other such sounds. It’s very believable. You really don’t want to step outside the elevator onto the plank. To increase the immersion factor, the developer has added the ability for users to place a real-world plank on the floor of their virtual reality play area. The app allows you to measure the real plank with your motion controllers so that the virtual plank in the app matches the real-world piece of wood that you choose as your plank. Another immersion hack is to find a portable fan and have it set up to face the person in VR. It’s these little touches that give you the sense that you are on this virtual skyscraper. So what happens if you fall off the plank? We won’t spoil it for you, but we will tell you that the ride to the bottom can make you sweat a little bit (or a lot). The fun doesn’t end there with Richie’s Plank Experience. There is a mode where you can use a hand-held jetpack to fly around the city and put out fires with a hose you hold in your other hand. We’re not sure where the water comes from, but we don’t care because it’s so much fun. Additionally, there is a skywriting mode as well, and there may or may not be an “add spiders” option. You’ll have to find out for yourself. Where Richie’s Plank Experience goes straight for it, #BeFearless from Samsung tries the crawl-before-you-can-walk method. We think there were doctors (or maybe lawyers?) involved in this one because this app has level progression, can be paired with a Gear S device to check your heart rate, and asks you how “nervous” you were after each level. If you’re too nervous, it won’t let you advance. #BeFearless - Fear of Heights, is actually two apps. One is called Landscapes, and the other is named Cityscapes. They include a virtual suspension bridge walk, driving on a cliff edge, a helicopter skiing experience, glass elevator ride, and several others. Unfortunately, these aren’t interactive games, they are just 360-degree videos of these experiences, and the video is pretty low quality, which doesn’t help the immersion. These two apps might be best for those who are very new to VR. They aren’t the most impressive or immersive experiences available, but they will at least allow users to get their virtual feet wet. Perhaps Samsung will upgrade the video quality for this app in the future and make it more immersive. While it is relatively easy to avoid situations in which fear of heights might be an issue, avoiding public speaking is not as easy because we are often required to engage in some form of public speaking whether it be for class presentations, business meetings, or even just giving a toast at a friend’s wedding. Speaking in public is just something that we have to try to muddle through, despite the anxiety it provokes in many of us. Fortunately, several VR app developers have come to our rescue and are creating apps to help people deal with their fear of public speaking. Samsung seems to want to help people get over their fear of public speaking because they have made no less than three different #BeFearless-branded Fear of Public Speaking apps. In the Fear of Public Speaking - Personal Life app, you are placed in a small group or one-on-one social circumstances where you interact in situations that you might encounter in daily life (outside of work and school). Activities include making small talk with someone on a train, making a toast, giving a speech, and even singing in a Karaoke bar (complete with licensed music from real artists). In the School Life app, you are in a collegiate setting where you have to make casual talk with classmates, attend a school conference, give a class presentation, and share your opinion with the class. The Business Life #BeFearless app brings work-related situations into the mix, such as a job interview, business lunch, team meeting, management presentation, and job fair. All three of the #BeFearless Fear of Public Speaking apps claim to rate your performance based on your voice volume, speaking pace, eye contact (based on VR headset position), and heart rate (if paired with a Samsung Gear S device with heart rate monitor). You can only progress to new scenarios when you’ve gotten at least a “good” rating on the current one. These apps are all free and worth a download if you have a fear of public speaking in any of these various scenarios. Limelight VR is a public speaking training app. It provides various venues (business meeting area, small classroom, large hall, etc. ), allows you to select the mood of the audience, and even allows you to interact with various objects such as markers, whiteboards, microphones, and podiums. The app also allows you to import slide decks from Google Slides so that you can practice giving an actual presentation just as if you were doing it for real. Far removed from the sweat-inducing fear of public speaking is the fear of those eight-legged nightmares known as spiders. Arachnophobia, as it’s officially known, is another common fear that will cause grown men to scream their heads off. The app lets you add more or fewer spiders, keep them under virtual glass, or allow them to hang out on your virtual desk with you while you try not to run out of the virtual room screaming. You can vary the exposure situation and level to whatever you’re comfortable with, and, don’t worry; there is a virtual first aid kit on your virtual desk in case things go wrong. TheBlu by Wevr is an excellent app for those who fear the ocean and sea creatures such as whales and jellyfish. In one of the episodes of TheBlu called Whale Encounter, you are placed underwater standing on the bridge of a sunken ship; various sea creatures swim by as does an enormous whale that makes eye contact. It is by far one of the most impressive experiences in VR. While we didn’t find any great apps for fear of flying in airplanes, there are several excellent relaxation-related apps, such as Relax VR, that can at least take you to a virtual happy place while you’re riding in an airplane. The immersion of VR can fool your brain into thinking its in a wide-open space rather than the claustrophobic confines of an airplane cabin. Additionally, there are a wealth of extreme-sports-related first person 360-degree VR videos that allow you to jump out of airplanes, ski down steep mountains, ride a rollercoaster, and do all kinds of other things you might not do unless you knew you couldn’t be gravely injured. Check with your doctor before you try anything that you think might produce severe anxiety. Don’t push yourself beyond what you’re comfortable with, and make sure your VR play area is clear of any obstacles so that you don’t get injured when attempting to use any of these apps.